Peter Sprague | The Lord of Song Sings Hallelujah! Greetings Good Folks, listening to Jeff Buckley’s version of “Hallelujah” and it’s a divine ride indeed. My cousin Gabe told me about this tune a long time ago. It’s a gem written by Leonard Cohen and today we play it at a service for a good fellow who has left us. There is sadness and beauty and this song holds the truth close. 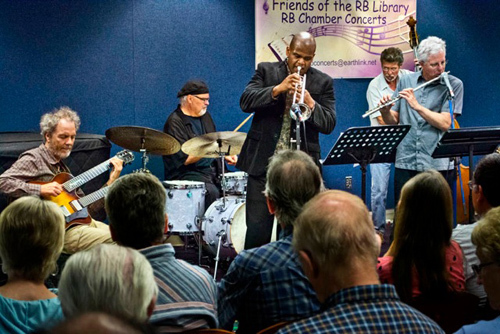 Last week Bop Mod terrorized the Rancho Bernardo Library with a great turnout and young Curtis Taylor on trumpet playing up a storm. What a joy to be inside the music with these folks and thanks to all that came out and to the good people (Don and Harvey) who run the show there. Throwing down at the RB Library! Left to right, Peter, Duncan, Curtis Taylor, Gunnar and Tripp. From the RB Library we left the next day and tangled with the traffic on the I-15 to make our way to the Rancho Mirage Library to share the music with the desert tribe. Great hit and I decided to stay on an extra day to soak up the heat. 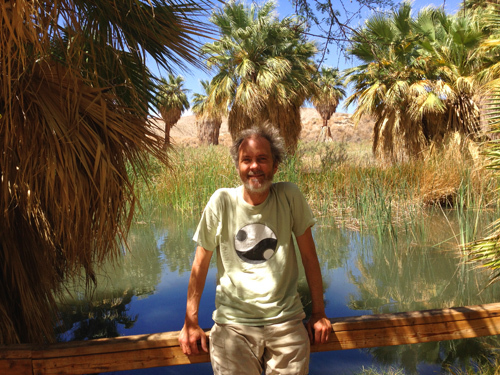 My friend Brian took me out to a magic oasis with palms swaying and water bubbling up from San Andrea’s curvy fault line. Mini mindblower! 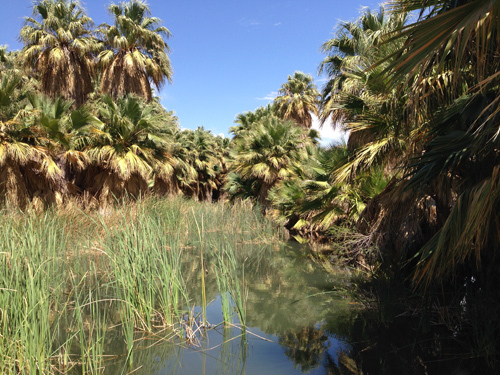 A half a mile away from this oasis it’s as dry and desolate as it comes. Legend has it that Charlie Parker bathed in this spot once. 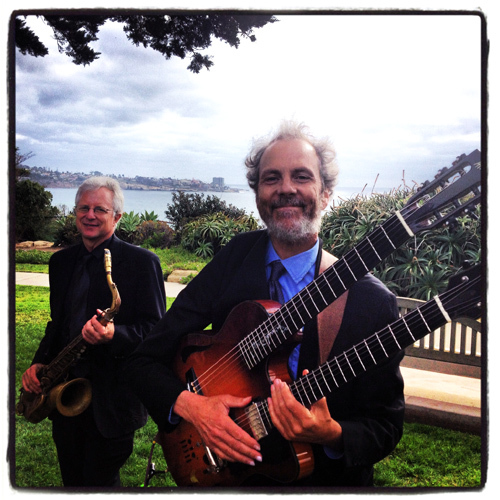 Next my brother Tripp and I got dressed up and played a gig overlooking the Scripps Pier in La Jolla. Other creative constituents joined in and even though it’s legally spring, it was chilly! Keep it varied, keep it coming! Leonard Patton, Kevyn Lettau, Matt Falker, Lisa Hightower, Gunnar Biggs, Duncan Moore, Mellisa and Nina from Mira Costa and me on guitar. We’ve had some good times working up the music and each singer will be featured, plus a bunch of vocal ensemble excursions as well. All of the songs are certified Sprague compositions executed with humor and schooled discipline. They are well rounded ditties. “When I look into you, the ocean in your eyes. I hope you can make it to the show, it’s going to be fun. Click here for more details. If you want to hear the music we’re preparing for the concert, click here. 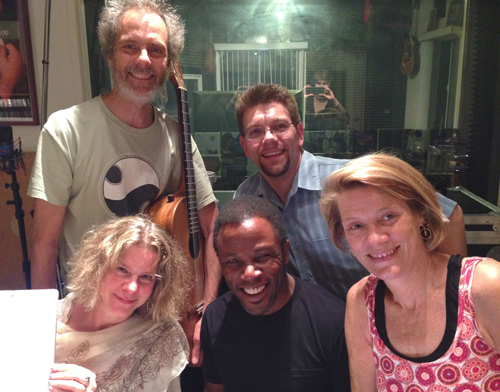 Rehearsing at SpragueLand with (left to right back row) Peter, Matt, (front row) Kevyn, Leonard and Lisa.